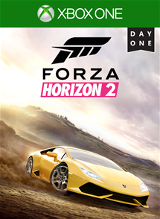 Forza Horizon 2 is a open world car racing game where you are a racer in the fictional Horizon Festival. This year we are racing around 4 cities in Europe competing in a 168 4-race championships utilizing over 200 different cars. Yes, there are over 168 championships this year and that’s just the tip of the iceberg. The best part of this game is the real variety in tracks and events. Forza 5 to me was stymied by each series being the same tracks just with a different class of car. I’m glad people like to race on “Sebring International” since it’s a real track. I did too… the first 15 times I raced it. Then it’s just tedious repetition with a car that goes slightly faster or slower than the last one. Horizon’s open world allows them so much more variety in both length and scope, but also the type of race. Not just limited to laps around a track, Horizon adds a ton of more options like point to point street racing, rally races over the countryside, along with both open street (I.E. with traffic) and close off circuits. Plus with each circuit being just 4 events you are moving on and changing cars and classes frequently enough that it keeps it fresh. They even make getting to the races more enjoyable. You are not simply thrown into the next Championship, you drive there. You explore, you earn xp, you earn perks. It’s the journey, not the destination. How fast can you blaze through that Speed Trap? A friend’s Drivatar is nearby, why not challenge them to a quick point to point race? There are 30 Bucket List challenges (with more to come) where you use some of the most iconic cars in existence trying to complete timed races and skill score earned in a set time, among many others. Hidden XP boards to locate. It’s really crazy the amount of stuff you can do just trying to get to the actual event. “But swaggers, I just want to race!” Well that is an option also as you can fast travel to the events and just get your race on (But it does costs you credits to fast travel and you do also need a skill (more on skills a little later!)). Horizon has an XP system like Motorsports 5 but with a more random reward system. Each level you earn you get a spin on the Horizon Wheelspin. Instead of a set amount of CR you earn either a random amount of CR or a car direct to your garage. One thing that is missing is the leveling of car manufacturers. I don’t miss the obnoxious achievements that went with it, but it was nice to get little bonuses for sticking to a manufacturer. Along with XP and levels to earn in Horizon there is also a perk system. There are 25 Perks to earn. You start at the middle and work your way out, with each layer costing more SP than the last. 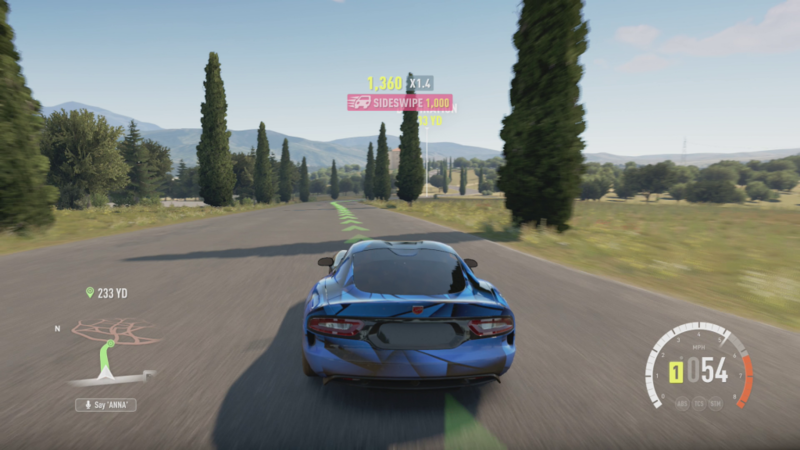 These are things like Hot Lapper; you earn 10% more credits in Rivals event or Paparazzi; An icon appears above cars you need for Horizon Promo. Promo being one of the many side activities where you are charged with photographing 100 unique cars for credit bonuses and an achievement. You earn SP to buy Perks by doing well and chaining abilities in both the open world and races. Things like near misses, burnouts, and speed all contribute to your SP. But hit a wall or another car before banking the points and it’s all lost. This is the major flaw in the system. Getting smashed from behind by a less than stellar player is counted against you when there is nothing you can do about it. In the Open World it seems like the AI Drivatars are out to get you. Wandering into your lane as you drive 150 mph down a open highway with a suicidal determination to destroy you both. Online in Horizons 2 is handled in two different modes. The main mode is Road Trip. This puts you in a standard 4 race championship with some more multiplayer types games like King and Infected thrown into the mix along with some Team Based Races. The kicker here is that between each of the 4 races you have a full on rally race to the next event that also scores XP. After each series everyone in the game gets to vote on the next series from 3 options choosing car class and the types of races. Unfortunately if the group votes on a class you don’t currently own you don’t get a chance to buy a car, you’ll be thrown into a stock car of almost always sub-par stats. With the amount of loading and free roaming going on it seems there is plenty of time to allow someone to buy whatever they want before the first event starts. The other type is to just go into Freeroam with some friends and pick and choose events or bucket list challenges to do. Even though this is Freeroam there are still limitations between playing Solo or in a Party. Some freeroam activities like Barn Finds just cease to work in Multiplayer so make sure you know what you want to do before joining up. The Forza series are a little less forgiving than other racers. Ability matters and car ranks definitely matter. In Solo this is offset by difficulties and assists, but in Online put two people with the same skill together and the one with the better car will always come out on top. 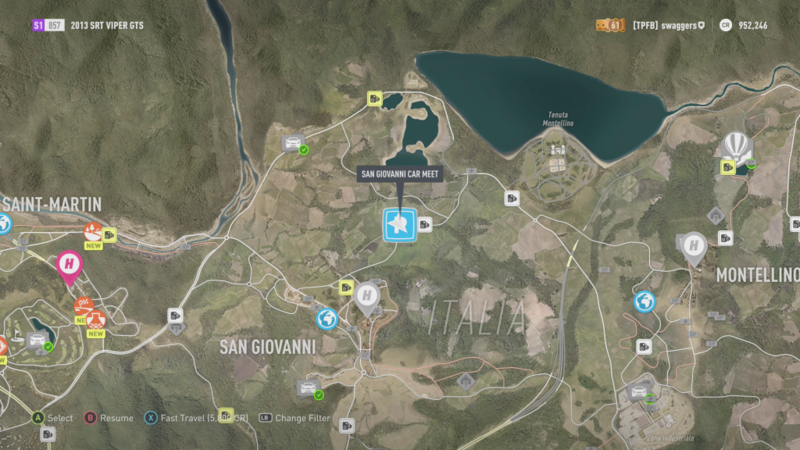 Due to the random nature of the online you need to have a series of cars pre-tuned for all levels of play as you are given zero time in multiplayer to tweak. As I mentioned before if you come into a S1 series with no tuned S1 car you’ll be 30 points behind before the race even begins. The game is just straight up gorgeous. The cars are amazing, the scenery is amazing, even the people are a lot more lifelike than even Motorsports 5. The rain and the weather, beside looking amazing, also effect your cars handling which adds a nice touch. If you had to nitpick anything there are minor issues, but completely minor. Things like tree branches overhanging highways. The whole world just looks alive and vibrant. The biggest strength of Horizon 2 is the depth of activities. You get bored with racing, you go search for some XP boards, you get bored of that you go do a couple Bucket List challenges, get bored of those and you’re back to racing, all in a stunningly beautiful world. If you’re a race fan you’re going to love it, if you aren’t, well Horizon 2 is the game that will make you a race fan.